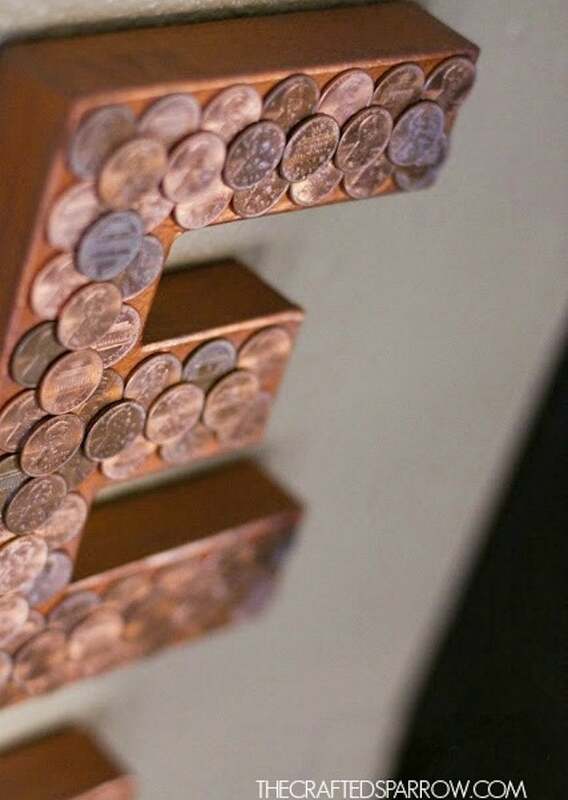 How to Make Your Own Letters—with Pennies! For copper accents in the kitchen that won't cost an arm and a leg, turn to your change jar. That's what brought this typography project to life! When Rebecca at The Crafted Sparrow had a friend move into a new home, copper accents were on the ultimate kitchen wish list. 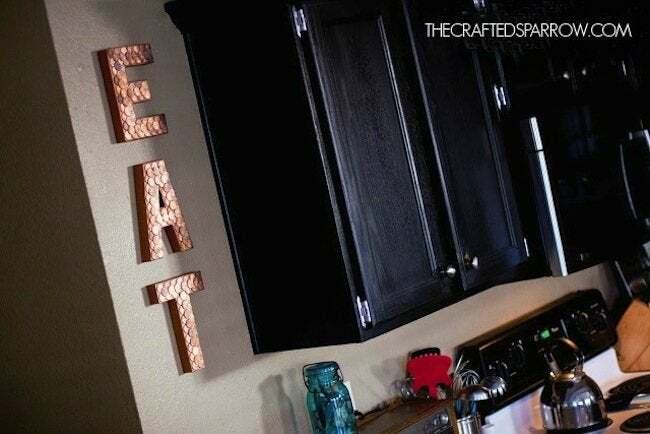 So, being the good friend that she is, she crafted an amazingly simple and stylish housewarming gift—DIY penny letters. So, empty out your change jar and ready your glue; she’s shown us how to recreate the project right here. 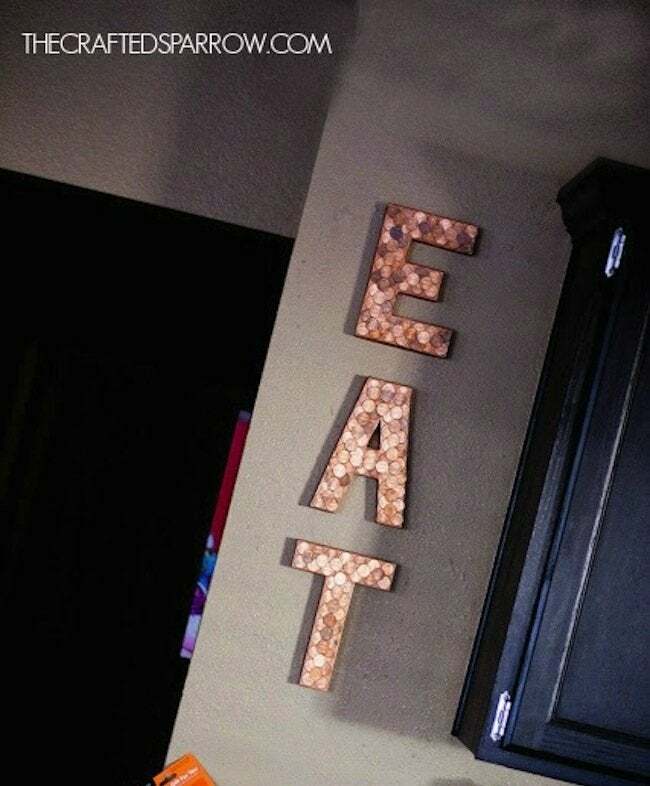 Start by painting your paper mache letters copper. I did two layers and that was enough to cover the paper mache. After I painted it copper I used a gunmetal silver color with a dry brush technique to give it a bit of a patina. Then get your glue ready. I think this glue worked pretty well. We’ll see how it holds up over time. You’ll also want to start picking out your “good” pennies. I picked mostly shiny, but threw a few duller ones into the mix. That creates character. I then laid out the pennies on each letter ahead of time. That way I new exactly what pattern, and placement they were going to be in. Then you just glue until your hearts content. When you’ve got them all glued on and they are all dry (let it sit for at least 24 hours) you can spray them with a clear satin or glossy spray paint. I did it to protect the pennies and the copper paint on the paper maché. Thanks for sharing, Rebecca! If you enjoyed this, check out even more DIY tutorials at The Crafted Sparrow.